A seagrass bed is an ecosystem which often occur alongside coral reefs. Although they are much less charismatic and frequently overlooked, seagrass beds play a vital role in maintaining the health and diversity of adjacent coral reefs. 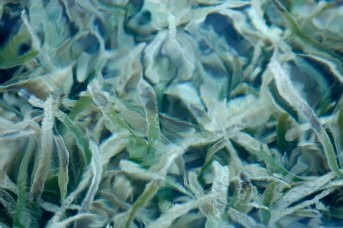 Seagrasses are not one but 50 species of flowering marine plants which usually form dense stands in the shallow, sandy bottom environments of back reef lagoons and semi-enclosed bays. They are bright sunlit fields of waving green fronds and are the favoured habitat of the globally endangered Green Turtle (Chelonia mydas) and Queen Conch (Lobatus gigas). Other common inhabitants are cushion stars, urchins and sea cucumbers. Seagrasses are quite literally a world apart. Scientists have found over 113 species of algae (marine plant) growing on seagrass leaves, not to mention sponges, hydroids, flatworms and tunicates. One of the most remarkable things about seagrasses is their ability to spread and grow by sending out underground rhizomes (roots). It is also their greatest weakness as it makes them phenomenally vulnerable to trampling and physical damage. Seagrasses trap sediment and bind soil thereby preserving water quality and protecting coastal environments. Similar to mangroves systems, seagrass beds provide an ideal hiding place for the young of many species of reef fish and other marine life. The Queen Conch (Lobatus gigas) hide for the first year of their life in the sand surrounding seagrass beds before emerging there to forage and live. Adult parrotfish (Scaridae), surgeonfish (Acanthuridae) and porgies (Sparidae) are also frequent visitors, migrating into seagrass environments to feed.